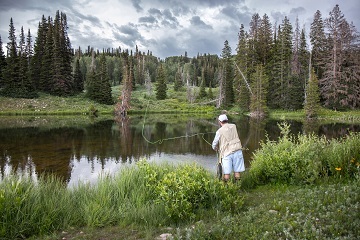 Beat the crowds and enjoy the scenery while fishing a cool mountain lake in Utah's backcountry. Make a quick trip to a river or stream close to your home, or, if you have more time, take a trip to a scenic fishing hole high in the mountains. Take your family to Willard Bay Reservoir or Utah Lake to fish for channel catfish. Visit a big, scenic reservoir, such as Flaming Gorge, where you'll find great scenery and likely some solitude too. If you're not going to keep the fish you catch over the holiday, Oplinger, sport fisheries coordinator for the Division of Wildlife Resources, encourages you to unhook the fish quickly and get it back in the water fast. "Warmer water temperatures can stress fish," he says. "If you're fishing a river or stream, put fish in areas where there is little flow: not too fast but not too slow. If you're fishing a lake, try to quickly release the fish in the clearest water possible. Try not to place the fish in an area that has stagnant water. There's not much oxygen in water like that." If cooler mountain air, spectacular scenery and good fishing are what you're after, consider a trip to the Uinta Mountains in northern and northeastern Utah, and the Boulder Mountains in the southwestern part of the state. The mountain ranges have it all: good fishing that's close to roads as well as opportunities to hike to high-elevation lakes far from the crowds. The Manti Mountains in north-central Utah are another high-elevation option. "The scenery on the Manti Mountains is spectacular," Oplinger says, "and the fishing can be really good." In addition to hiking to lakes on the mountains, riding an all-terrain vehicle is a great way to reach many of them. "A nice network of ATV trails has been established on the Manti Mountains," he says. "The trails will get you close to many of the lakes." Maps of areas with high-elevation lakes in Utah are great tools to locate the lakes and see how to reach them. You can buy maps at U.S. Forest Service offices and at the DNR Map & Bookstore, 1594 W. North Temple in Salt Lake City. The best topographical maps are 7.5 minute quad maps. You can also learn more about the lakes, and stay current on fishing conditions and success, by reading our weekly fishing reports. The reports are available at www.utahfishinginfo.com/dwr/fishingreports.php. Online fishing forums, such as bigfishtackle.com and utahwildlife.net, are also good places to get information. If you'd rather fish moving water, three rivers in northern Utah-the Logan, Blacksmith Fork and Weber-top Oplinger's list. So does the Provo River in north-central Utah. "But virtually every mountain stream has trout and can provide good fishing," he says. "Find a river close to you, and give it a try. Some of these lesser known rivers and streams aren't fished much, but they can still provide great fishing." If you're fishing a river or stream in southern Utah, don't be surprised if the water level is especially low this summer. "Late August is usually when rivers and streams reach their lowest point," he says. "This year, though-during a time when rivers and streams should be their highest-waterways in some parts of southern Utah have dropped to levels never seen before. We'll have to wait and see what happens." If you're fishing a river or stream that's running low, deep pools can be excellent places to cast your fly, lure or bait. "During low water conditions," Oplinger says, "trout will often congregate in these deep pools." Fish at lower elevations can often become lethargic and less willing to bite as the water temperature warms. Channel catfish are an exception, though. They don't seem to mind warm water at all. "Fishing for channel catfish is a perfect, close-to-home opportunity for those living along the Wasatch Front," Oplinger says. "Willard Bay Reservoir north of Ogden, and Utah Lake, just west of Provo/Orem, are two of the best catfish waters in Utah." In addition to good fishing for catfish, state park facilities, including rest rooms with running water, picnic tables and covered pavilions, can make a fishing trip to one of these waters a great experience for your family. If you have a boat, and you'd like to escape the crowds by fishing on a big body of water, Flaming Gorge Reservoir in northeastern Utah is a good bet. In addition to spectacular scenery, the reservoir also offers areas with rest rooms and other modern facilities. "Flaming Gorge is usually thought of as a good place to fish from a boat," he says, "and it is. But there are some shore fishing opportunities in the summer too." Lake trout, kokanee salmon and smallmouth bass are prime fish to catch at Flaming Gorge in the summer. If you're fishing for lake trout, please keep your eight-fish limit of smaller fish (lake trout less than 28 inches long). "There are too many smaller lake trout in the reservoir," Oplinger says. "Keeping a limit of smaller fish will allow the remaining lake trout to grow to a larger size."